Rajasthan NEET Counselling 2018: The NEET UG Medical & Dental Admission/Counseling Board-2018 in coordination with the Principal/Controller, SMS Medical College & Attached Hospitals, Jaipur will release today i.e. Monday June 25, 2018 Indicative Allotment Information on its official website. “Indicative Allotment Information – based on the choice filled by the registered candidates up to June 24 05:00 PM will be released on Monday June 25 in the evening by 05:00”, The NEET UG Medical & Dental Admission/Counseling Board-2018 says. 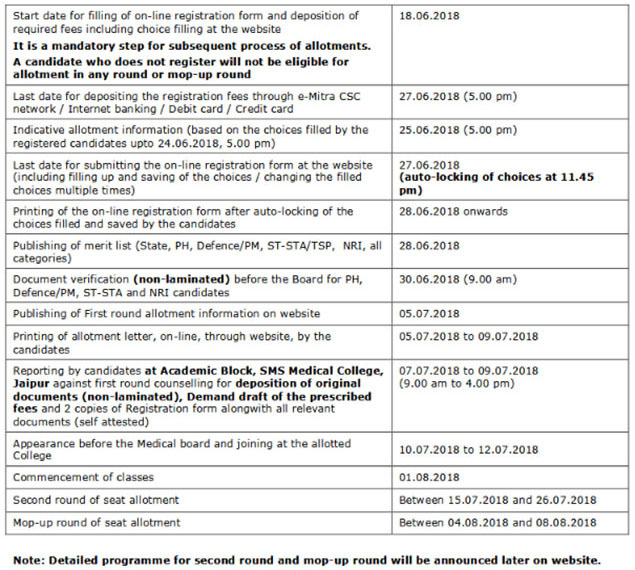 NEET UG Medical & Dental Admission/Counseling Board-2018 in coordination with the Principal/Controller, SMS Medical College & Attached Hospitals, Jaipur had started from Monday June 18, 2018 registration of candidates who have cleared the NEET exam this year with scores mentioned in notification. “The process of NEET UG Counselling (Rajashtan_ 2018 for NEET qualified candidates has started online from 18th June, 2018”, office of the Chairman, NEET UG Medical & Dental Admission/Counseling Board-2018 in coordination with the Principal/Controller, SMS Medical College & Attached Hospitals, Jaipur, said. “The NEET UG 2018 counseling will be conducted for admissions in all Government (85% state quota including NRI) and Private (85% state quota and 15% NRI) Medical and Dental colleges in Rajasthan, as per the rules and regulations laid down by Rajasthan University of Health sciences/Medical Council of India/Dental Council of India and directions from the Central Govt., State Govt. and Hon’ble Supreme Court and Hon’ble Rajasthan High Court”, Rajasthan neet counselling 2018 notification said. “The NEET score along with some relevant data has been provided by the Conducting agency of NEET 2018 to the Rajasthan State NEET UG Medical & Dental Admission/Counseling Board-2018. All the allotments will be done by this Admission Board constituted by the State Govt comprising of all Principals of Medical/Dental Colleges of the state and others”, it added. “During the process, the eligibility criteria, relevant documents, etc. of the candidates shall be verified and Medical/Dental College shall be allotted to the candidate according to the merit, the choice(s) filled by the candidate and availability of the seats as per the reservation policy of the state but the admission will be subject to verification of his/her documents for which the decision of the Principal of the concerned allotted college or the board will be final”, it said. All candidates are required to deposit non-refundable registration fee of Rs. 2000/- (Rs. 1200/- for SC, ST, ST-STA category candidate of Rajasthan state domicile as well as candidate whose family annual income is less than INR 2.5 lacs) + applicable e-mitra charges through Internet banking / Debit card / Credit card or at any e-Mitra CSC kiosk center (authorized by the Government of Rajasthan). The registration fee is neither refundable, nor transferable and nor adjustable for any future State UG admissions. Any plea in this matter shall not be entertained. The minimum age limit is 17 years on or before 31st December 2018. The maximum age shall be 25 years as on the date of the NEET 2018 examination i.e. 06.05.2018. There will be relaxation of 5 years in the upper age limit for SC, ST, ST-STA, OBC, MBC and PH candidates. National Eligibility Entrance Test (NEET UG -2018) is organized all over India. Students who had cracked 12th standard Rajasthan board exam can participate in NEET. After declaration of NEET result, every state individually accepts online applications for admission to medical colleges in its jurisdiction.